True courage is something that many aspire to but few achieve. Victoria Cross Heroes is the story of ordinary people who performed extraordinary acts of bravery. Those who receive the VC, for valour as the inscription states so simply and so powerfully, are real heroes who more often that not sacrificed their lives in order that others survived. Today there are only 12 living holders and their numbers are dwindling. This three x one hour series has been made by Empire Media Productions for channel five. It tells the incredible stories of some of the 1351 winners from the Crimea through to Iraq and the great conflicts of the 20th century in which British and Commonwealth forces have been involved. 'Victoria Cross Heroes' is a high-end specialist factual programme, made by experienced history programme makers. Its budget and ambition bring high production and editorial values to the screen. Each programme is based around the stories of 2 or 3 main VC holders and their actions, while the journey of the medal's evolution is told through fascinating archive materials and well structured interviews. The films are a mixture of the personal testimony of holders and their families, never before seen archive footage and painstakingly accurate and visually stunning dramatic reconstruction. What made William McFadzean dive onto a smoldering box of grenades in Somme trench, saving 7 of his unit? Why did medical doctor Noel Chavasse tragically insist on returning to the front line to rescue more men after already winning one VC? And how did Private Johnson Beharry's belief that he would never die affect him? What was it that that made him repeatedly expose himself to enemy fire enabling him to rescue his commanding officer and 20 other men? The essential question at the heart of the series is the thing that makes the VC so compelling, what goes through a person's head in this moment of truth? What makes one person act in valour and another turn away? What makes one person ignore personal safety while someone else runs for cover? And relevant to every person who watches, the nagging desire to know what they would do in the same position? The stories are amazing, ranging from breathtaking acts of fighting prowess to astonishing moments of compassion and self sacrifice. The series is gripping, moving and visually spectacular. It puts the audience on that ship, in that trench in that place, to have them share in a moment of extreme jeopardy when one person's snap decision will make the difference between life and death. Programme One: 'WARS OF EMPIRE' centres upon the VCs of the 19th Century, from its hugely popular instigation by Victoria in 1856 after the Crimean war to the war that ended her era, the Boer war at the turn of the century. The Victoria Cross was immediately taken to heart, its winners becoming celebrities equivalent to the pop stars and footballers of now. It includes dramatic reconstructions of Rorke's Drift, from the Indian Mutiny and the Crimea. Programme Two: 'THE GREAT WAR' tells the story of the VC through the first World War. Half of all VCs awarded to date were done so between 1914 and 1919. From the Western Front, through the Somme to Gallipoli, such was the variety of battle that every facet of human bravery was exposed. Stories featured include that of Noel Chavasse, one of only three men to win the VC twice, Boy Cornwell, the youngest recipient, and Billy Leefe-Robinson who shot down a Zeppelin over London to national acclaim. Programme Three: 'THE MODERN AGE' brings the story of the VC up to date. From the air and sea battles of WWII, through Korea, Vietnam, the Falklands and the current Gulf War, British soldiers have been fighting every year for the last 60 years. And through these years the VC has been awarded less and less. Has the nature of battle changed so much that men are no longer faced with such danger, or has the attention around the VC become so great that the Generals are scared to award it? This most contemporary of the three films includes interviews with Ian Fraser who won the VC as part of a midget submarine attack on a Japanese warship in 1945, Bill Speakman who won his medal in Korea, Ram Bahadur Limbu the Ghurka from Sarawak in 1965, Keith Payne the garrulous Australian in Vietnam, and the most recent winner Private Johnson Beharry from the Iraq conflict. The producers have also had exclusive access to the remarkable private collection of VCs numbering 142 held by Lord Ashcroft, the international business man. It is the largest and most valuable collection of VCs in the world spanning every branch of the armed forces across 150 years of warfare. The collection has never been made available before. In an exclusive interview Lord Ashcroft talks movingly about his rationale for building the collection and why it means so much to him. Visit the channel five Victoria Cross Heroes website for more exclusive interviews with Lord Ashcroft and to see more clips from the series. To coincide with the broadcast of the major three part channel five documentary series about the Victoria Cross which was first screened on channel five in November 2006, the complete series has been released on DVD. The Victoria Cross is Britain's highest military award for valour on the battlefield, at sea or in the air. Since its incorporation in 1856 on the instruction of Her Majesty Queen Victoria, the Victoria Cross has held an unrivalled position in the history of warfare and heroism on the battlefield. Victoria Cross Heroes is introduced by H.R.H The Prince of Wales, to commemorate the 150th anniversary of the Victoria Cross. The Prince is President of the VC and GC Association and with the Royal Family's long association with Britain's armed forces, the medal holds a particular resonance and significance for The Prince of Wales. Victoria Cross Heroes uses first-hand testimony, rare archive film and dramatic reconstructions to tell some of the remarkable stories of the 1,351 heroes awarded the VC during the past 150 years. This landmark series also includes moving interviews with many of the twelve living holders of the ultimate award for bravery in warfare. This definitive three-hour series explores the stories behind the award of the medal and traces the heroic exploits of those awarded the VC. The producers also have exclusive access to Lord Ashcroft KCMG's collection of VCs. This unique and extensive collection, which is held in trust, spans every branch of the armed services and includes medals from many of the campaigns involving British forces over the past 150 years. 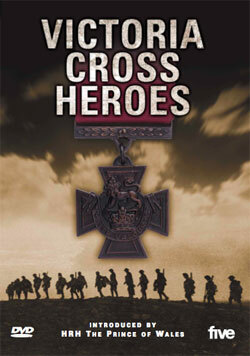 To purchase a copy of the Victoria Cross Heroes DVD please click here. A copy of the DVD was sent to every secondary school in the UK with a classroom resources pack in 2007.